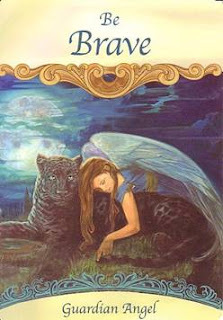 Card of the Day ~Be Brave~ Although it may feel as if you’re unsafe or in the dark, your guardian angel assures you that you are completely safe, protected, and guided. Don’t be fooled by illusions of fear-instead, be courageous and shore up your personal strength. There’s a blessing in this situation, and by focusing on finding that benefit, you’re sure to discover it. Someone by whom you’re presently intimidated by will soon prove to be your loyal ally. Do your best to see God within everyone, within the situation...and within yourself. There’s truly nothing to fear in these circumstances. It’s actually an opportunity for you to grow stronger and more experienced, and to develop higher self-esteem. Don’t run from conflict, but face it with grace and love. Pray and ask for Heavenly help, and it’s assured. This situation will resolve itself rapidly in a miraculous way. Your role is to stay positive, speak your truth, and be brave. Have faith in yourself and your abilities and shine like the bright star you truly are!!! Have a magnificent day. I love you all!